Video and in particular mobile video, is the fast growing type of content & is dominating the social platforms with Facebook’s algorithm even prioritising this format – and it’s not hard to see why. As more and more traffic is from mobile devices, captivating your audience in a fully immersive vertical format is key. But how do you create these engaging videos? Well, look no further than the social mobile giants Instagram & Snapchat. These platforms make it super easy to create cool and interesting content for your audience. So why should you add Instagram stories on your website? Whether you’re a brand, business or blogger, having stories & engaging video content on your website as well as on your social accounts is sure to help boost engagement. By repurposing stories & therefore having mobile video content on your website you can create a massive advantage over your competitors. It will give your site a revamp by adding fresh and current content regularly, and allow you to jump on the growing social video trend. On Instagram more than 50% of businesses produce a story regularly which has increased the app’s average usage to 32 minutes a day for under 25s (24 minutes a day for over 25s). Think about it – clearly video stories have people hooked! So by adding this content to your website it means more time spent on the site and if visitors like your content they are more likely to explore the site and any services/products that you provide. Bringing your site to life with stories is a no brainer really! How to add stories to your website automatically? 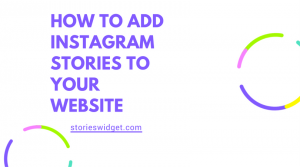 The best and only way to add Instagram stories on your website is by signing up to the Stories Widget, a service that fetches an account’s Instagram stories every 24 hours. Each story is then added to an embeddable widget which is then displayed on your website. Signup 👉 add widget to your website 👉 see your stories magically appear! All you have to do is carry on making great content!